With its bold burst of color, this sophisticated pendant necklace makes a decidedly brilliant statement. 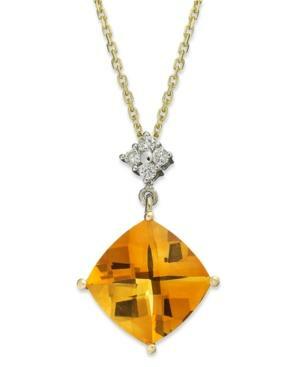 The elegant 14k gold design showcases a cushion-cut citrine (5 ct. t.w. ), beautifully highlighted by full-cut diamonds (1/10 ct. t.w.). Approximate length: 16 inches. Approximate drop: 1 inch.